An incubator is an enclosed chamber used for maintaining a living organism in a controlled environment. The ancient Egyptians and Chinese both devised incubators to hatch chicks from eggs without having the mother hen sit on them. This enabled hens to continue laying eggs without interruption. Egyptian incubators were large rooms heated by fires where attendants turned the eggs at regular intervals so they would warm evenly. Chinese incubators were warmed by fire or by rotting manure. In 1588 Jean Baptiste Porta, an Italian inventor, drew on the ancient Egyptian design to build an egg incubator. He was forced to abandon his work during the Spanish Inquisition (a 1478 movement instituted by King Ferdinand and Queen Isabella of Spain during which many people were tortured and killed in the name of religion). Later on, Dutch inventor Cornelius Drebbel also invented an incubator to hatch eggs. Frenchman Rene-Antoine Ferchault de Reaumur (1683-1757) revived interest in egg incubation in Europe around 1750. Reaumur's device was warmed by a wood stove. The temperature was controlled by a thermometer he also invented, which gave rise to the temperature scale named after him. The success of Reaumur's incubator—French king Louis XV (1710-1774) enjoyed helping the chicks hatch—helped boost commercial production of foodstuffs at the beginning of the industrial era. The incubator was further developed by Abbe Jean-Antoine Nollet (1700-1770) and later by Abbé Copineau, who used alcohol lamps as a source of heat. Modern egg incubators are huge and may handle a million eggs at a time. The 1880s saw the introduction of incubators to keep premature (born too early) or extremely weak babies warm. Often, the incubators were warmed by pans of hot water placed under them. Etiene Stephane Tarnier, a French obstetrician (1828-1897), devised an incubator for the care of prematurely born infants. It was warmed by a kerosene flame and used at the Paris La Maternite (a birthing hospital). A number of "incubators with living children" were demonstrated in Turin, Italy, at the 1898 Italian Exhibition. Today incubated infants are enclosed in chamber that is well ventilated (allows for the movement of air), with the temperature maintained at about 31 to 32 Celcius (88 to 90 Fahrenheit). The air is also humidified and filtered. The incubators are made of plastic and Plexiglas. Incubators have contributed to the much-improved infant survival rate, even of very low birth-weight infants. 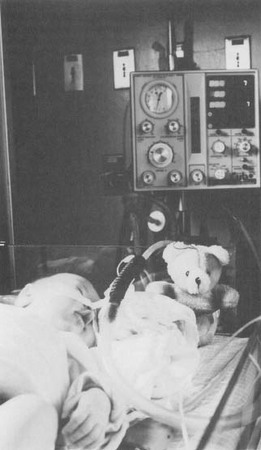 A baby grows stronger under care in an incubator. the information was great!! i needed it for a science experiment research for school and i got all the info i needed Wonderful!! !